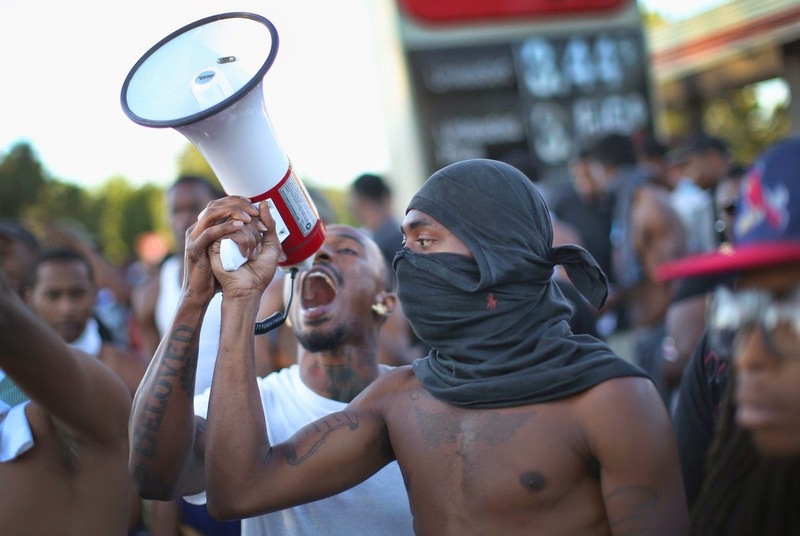 the Northern Worker: Justice for Michael Brown! “I don’t have a gun, stop shooting!” — Michael Brown, Rest In Power, killed by a Ferguson, Mo., police officer on Aug. 9. Unarmed, Michael had already been shot in the back once when—according to witnesses—he turned around, raised his arms in the air to surrender, and pleaded for his life. Brown, an African American, was then shot to death by a reportedly white police officer. Thousands of people in over 100 communities held vigils on Thursday in remembrance of 18-year-old Michael Brown, who was killed by Ferguson, Missouri, police on Aug. 9. Protesters demonstrated their solidarity with a moment of silence, told stories of police brutality, chanted demands, and raised their arms as Brown had done, among other things (use hashtag #NMOS14 to search the powerful photos). Events took place in towns and cities from London to California. These vigils were inspired by the Ferguson community’s own mobilizations; they have courageously faced down police violence on a nightly basis since Brown’s murder. They have continually taken to the streets and demanded justice for Brown, who was “shot like an animal,” according to eyewitness and friend Dorian Johnson. Ferguson police have been deployed in military style, training sniper laser beams on protesters from atop military Hum-V trucks. They’ve shot tear gas, smoke bombs, and rubber bullets at the crowds. They’ve arrested peaceful protesters, journalists, and politicians, and even got the FAA to institute a No-Fly Zone over Ferguson until Aug. 18. These asymmetric urban battles between military-armed police and overwhelmingly peaceful protestors are ripping the fraudulent notion of a peaceful American society into shreds. Several on-line articles noted that these scenes looked too close for comfort to battles between Palestinians and the Israeli Defense Forces. It turns out the comparison may not be too far off. On Twitter, Gaza residents sent messages to Ferguson protesters with instructions on how handle tear-gas attacks. Across the barricades, it was revealed that the St. Louis County police chief received training in Israel. Governor Jay Nixon stated at a news conference, “[Ferguson] is a place where people work, go to school, raise their families and go to church. But lately it’s looked a little bit more like a war zone, and that’s unacceptable.” Nixon announced on Aug. 14 that the Missouri Highway Patrol is taking over law enforcement in Ferguson. Immediately, the Hum-Vs with sniper posts and the SWAT squads clad in heavy body armor and gas masks vanished from the streets. Obama’s reference was to the fact that two reporters, one from the Washington Post and the other from the Huffington Post were cuffed and detained by police while they were working on their stories inside a MacDonald’s in Ferguson. The Washington Post reporter, Wesley Lowery, was slammed against a soda machine by the cops, although he clearly identified himself as a member of the press and did not struggle or resist his arrest. At the police station, the cops refused to give the reporters their names or badge numbers. The fact that the president of the U.S. felt compelled to state that American police “should not” be arresting journalists for doing their jobs is very revealing indeed! Here we have the governor, U.S. attorney general, and president, all acting as if they’re our allies in the struggle, all decrying the heavy-handed police response, these men who are surely taking steps to make the police response look better in the news—and yet none of them have shown that they are seriously committed to dismantling the New Jim Crow. Their purpose, like that of the Rev. Al Sharpton (who is now in Ferguson), while somewhat validating people’s feelings of anger and disgust, ultimately is to cool down the movement and restore trust in the legal process. The way the game is played these days, it seems, is that if the people raise enough of a stink about a police brutality incident, the Justice Department opens an investigation, and everyone is supposed to go home and wait for the results. “We should comfort each other and talk with one another in a way that heals, not in a way that wounds. Along with our prayers, that’s what Michael and his family, and our broader American community, deserve,” stated President Obama. He added, “To become violent in Michael Brown’s name is to betray the gentle giant that he was. Don’t be so angry that you distort the image of who his mother and father told us he was.” Sharpton and others led the crowd in prayer, songs, and chants. Sharpton and Obama would have us believe that by protesting Michael’s death we might be disrespecting his grieving mother. There is a reason we are encouraged to pray, remain silent, and reflect, rather than hitting the streets (loud and proud) to demand justice. Authorities know the conditions exist for a Ferguson-type confrontation between the community and the police in every American city. The police violence, brutality, and racism in Ferguson are universal across America, and the situation is explosive because people have had enough. In the face of unchanging conditions and bankrupt leaders, it is important not only to continue mobilizing in Ferguson, but also around the country. Attend whatever moments of silence, rallies, vigils, and/or protests that are being held close to you. Make your own posters and bring them. But the fact of the matter is that there is a national epidemic of police brutality, from the seemingly mild version (like verbal harassment) to execution-style murder. And it is happening all the time. It must be confronted, and those leaders who refuse to call The New Jim Crow what it is and fight against it must be tossed aside. Politicians speaking empty words about justice in the face of what amounts to genocide, apartheid, and oppression must not be supported. The young generation watched George Zimmerman walk free after murdering Trayvon Martin in cold blood. They want more than the proverbial “band-aid on a bullet wound.” They want real results—not only justice for the individual victims and their families but also a fundamental change, a real break with the past in both policing and incarceration. For police brutality to end, for the killings to end, for America to confront the human rights tragedy going on across the country, we must mobilize at every chance, stay in the streets, and push the agenda forward. Right now is the moment to drive this discussion further. It is important to mobilize, organize, and fight back, or everything will continue as if the current situation is acceptable. Take to the streets, join a protest, go to a rally, attend a vigil, and be a part of the movement! End police brutality! End mass incarceration! No justice, no peace! > The article above was written by Clay Wadena and is reprinted from Socialist Action newspaper.